The automation of your garage door is carried out by the opener, which is also the motor unit that generates the horsepower the system needs to initiate the closing and opening action. Because this device is comprised of both mechanical and electrical components, there are all sorts of problems it could potentially suffer from. Rest assured that whatever the reason for a malfunction may be, our experts will be able to quickly solve it. The internal gears are the main part of the opener's motor that can experience some issues after a while. They tend to gradually wear out over time, and will eventually break and will need to be replaced. You can usually tell something's wrong with the motor when the machine starts making strange whirring sounds when you use it, or when it fails to be able to move the door at all. The wiring and the circuit board are the main electrical components that can give you some problems as your garage door opener ages. Things like unexpected power surges can cause them to fry, at which point replacing them will be necessary. You'll be able to tell something's wrong when your door starts behaving erratically, opening and closing inconsistently. Because the opener automates the movement of the door, it has special features that allow it to detect when someone or something is presenting an obstacle. As part of a good opener maintenance routine, these features need to be tested to ensure their working correctly, and that their repaired in case something is wrong with them. Our experts always check the alignment of the safety sensors and the force limit settings of the auto-reverse mechanism during every maintenance visit, and we will make sure that your opener is safe for you to use. 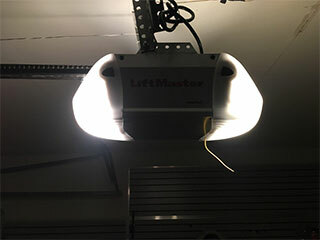 Depending on the type of drive your garage door opener uses, it could require a lot of maintenance or barely any. Chain drive units will need to be adjusted and greased, while screw drive models will barely require anything more than a little lubrication maintenance. Whether you have one of those types of openers, or a silent belt drive unit, our team will be able to help you when problems arise. Our technicians at Garage Door Repair Friendswood do more than just fix motor units when they break down. We also specialize in opener replacement and installation, and our experts will gladly consult you on this topic.